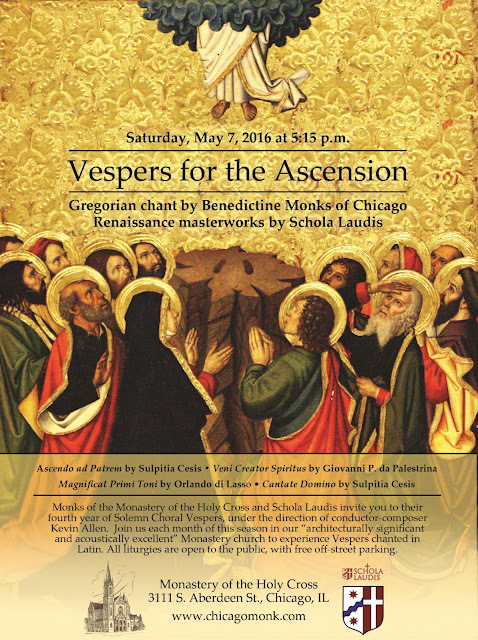 This Saturday, May 7 at 5:15 p.m., the Monastery of the Holy Cross in Chicago will celebrate First Vespers of the Seventh Sunday of Easter. Since the community observes the Ascension on its traditional day, Saturday’s liturgy will not be that of the solemnity itself but, as it falls within the Octave, the will feature elements which reflect the day’s traditional place in Ascensiontide. Schola Laudis will sing two motets by the early 17th century composer Sulpitia Cesis, a nun at the Augustinian convent of S. Geminiano in Modena, Italy. One of the earliest published female composers in Europe, she is known today especially for her eight-part Spiritual Motets. Palestrina will supply the setting of Veni Creator Spiritus, Lassus the setting of the Magnificat, and the monks traditional Gregorian chant. We hope that many NLM readers in the Chicago area will be able to join us!